Fitzgerald and Thatcher spoke about the IRA-Libya relationship. 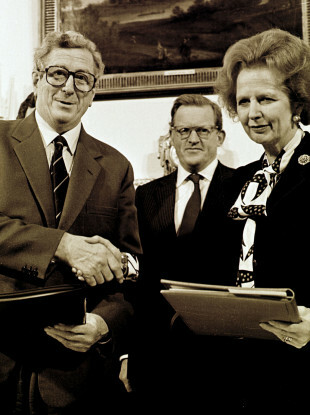 TAOISEACH GARRET FITZGERALD told Prime Minister Margaret Thatcher in a 1986 meeting that John Hume “will generally do what he is asked to do”. The frank assessment came in meeting between the pair in The Hague, Netherlands in which FitzGerald also spoke about unionists “getting tired” of Ian Paisley. Confidential notes on the June 1986 meeting have been released to the National Archives under the 30-year rule and show the two leaders attempting to tease out unionist disquiet over the Anglo-Irish Agreement they signed the previous year. The Anglo-Irish Agreement gave the Irish government a formal role in Northern Ireland and it was vehemently opposed by many unionists. During the course of the meeting, FitzGerald suggested that governments declare that the agreement “does not represent joint authority”, as a way of placating moderate unionists. “We could jointly state what the Agreement does and does not do. This sort of statement could help those who are getting tired of Paisley,” FitzGerald stated according to the documents. They have now lost the Assembly and they will not talk about devolution. Their answer to everything is “no”. We abolished the Assembly because it was not carrying out its proper function of vetting the executive. We have not got very much out of John Hume either. FitzGerald: Yes. Even the unionists are saying now about the nationalists, “They have got nothing”. It is very important that in the Autumn there should be progress in specific areas. Thatcher: To some extent that depends on what John Hume does. FitzGerald: John Hume will generally do what he is asked to do. He even appeared on TV in the south in favour of divorce. In the remainder of their meeting, the two leaders spoke about the courts system in Northern Ireland, with FitzGerald stating that action must be taken to improve them. “There must be action there to improve confidence in the administration of justice. We are looking to the proposal for three-man courts. That should not be controversial in Northern Ireland,” FitzGerald stated. “That is not necessarily so,” Thatcher responded. Email “Garrett FitzGerald told Margaret Thatcher: 'John Hume will generally do what he is asked to do'”. Feedback on “Garrett FitzGerald told Margaret Thatcher: 'John Hume will generally do what he is asked to do'”.